Mad Dog & Merrill® - "GRILLOLOGISTS"
Internationally recognized and self-proclaimed "Grillologists," Mad Dog & Merrill®, entertain and educate thousands of backyard enthusiasts every year with the finer points of grilling. They want nothing more than to make everyone a better griller and have a ton of fun doing it! Mad Dog & Merrill® travel the country performing in front of live audiences and hosting the TV series Mad Dog & Merrill® Midwest Grill'n that shows viewers how easy it is to be creative and entertain in their own backyard. Enjoy this web site and a comprehensive behind the scenes look of the most entertaining and knowledgeable "Grillologists" of the past 35 years, Mad Dog & Merrill®. Mad Dog & Merrill's® Midwest Grill'n. Contact Us to find out more! 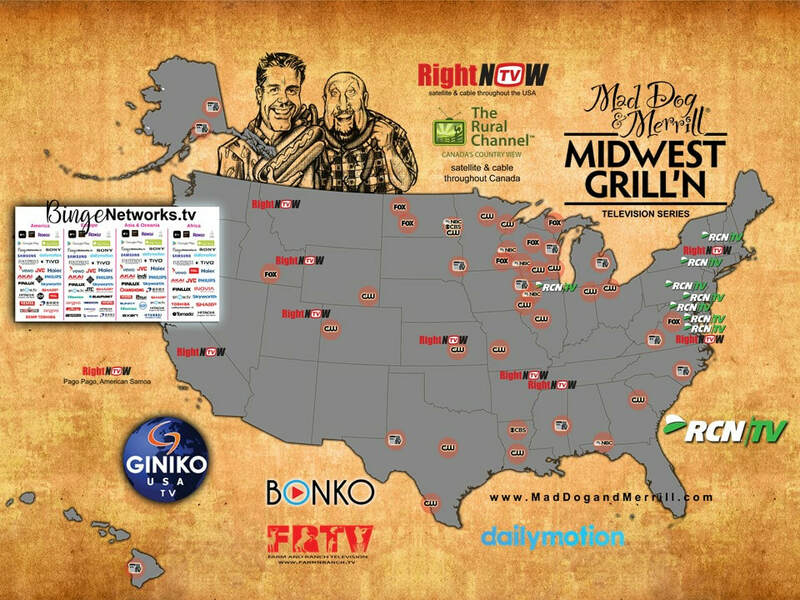 Mad Dog & Merrill® Midwest Grill’n is available to 15 Million+ Households per AIRING. This does not include The Rural Channel in Canada, Online and World-Wide Video On Demand and Streaming Channels. Household numbers are estimates and should not be considered as actual. DMA and HH estimates provided are as of January 1, 2017 and used throughout the 2016-2017 television season. Click the button to be taken to our Store Locator! Just enter your zip code for directions and a list of stores near you where Mad Dog & Merrill® products are sold! Sign up for the Free News From the Grill! LASHBRO, LLC AND MAD DOG & MERRILL, INC. ARE SEPARATE AND DISTINCT LEGAL ENTITIES AND ARE NO WAY REPRESENTED BY OPERATIONAL OR MANAGERIAL DECISIONS MADE BY THE OTHER.